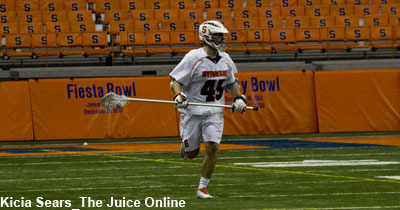 After being down by as many as four goals in the first quarter, Syracuse rallied for a gritty win against an old rival. Randy Staats’ four goals helped erase an early 5-1 deficit as No. 1 Syracuse defeated No. 16 Johns Hopkins 13-10. The Blue Jays started quickly, scoring the first three goals of the game, and eventually went up by four after John Crawley scored with 4:23 left in the first quarter. 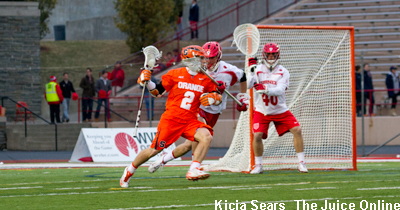 But SU’s defense held Johns Hopkins scoreless for more than 15 minutes, and in that time, the Orange scored seven times (from six different players) and eventually took an 8-6 lead into intermission. The teams would be knotted at 10 in the early part of the fourth quarter before SU’s final push. Dylan Donahue broke the tie with a transition goal with 7:39 left, and then Henry Schoonmaker added an unassisted goal to give the Orange a 12-10 cushion shortly after. Staats added the final score of the afternoon on an empty-netter with 1:22 left to keep SU (6-0) undefeated in the 2015 season. Johns Hopkins fell to 3-4. Nicky Galasso and Schoonmaker each scored a pair of goals, while goalie Bobby Wardwell made three saves in the fourth quarter (five overall) to collect the win. Ben Williams continues to impress, as he won 16 of 27 faceoffs and added 11 ground balls. Ryan Brown and Shack Stanwick each had a pair of goals and assists for the Blue Jays.